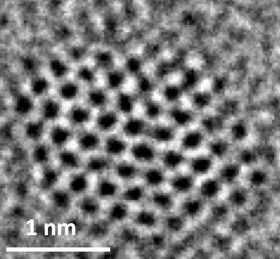 A single nitrogen-doped graphene quantum dot with zig-zag edges. Image: Ajayan Group/Rice University. Graphene quantum dots may offer a simple way to recycle waste carbon dioxide into valuable fuel rather than release it into the atmosphere or bury it underground, say scientists from Rice University. In a paper in Nature Communications, the team, led by Rice materials scientist Pulickel Ajayan, report that nitrogen-doped graphene quantum dots (NGQDs) make an efficient electrocatalyst for producing complex hydrocarbons from carbon dioxide. Ajayan and his team describe how electrocatalysis with NGQDs can convert carbon dioxide into small batches of ethylene and ethanol. Though they don't entirely understand the conversion mechanism, the scientists found that NGQDs worked nearly as efficiently as copper, which is also being tested as a catalyst to reduce carbon dioxide into liquid fuels and chemicals. As an added advantage, NGQDs retain their catalytic activity for a long time. "It is surprising because people have tried all different kinds of catalysts. And there are only a few real choices such as copper," Ajayan said. "I think what we found is fundamentally interesting, because it provides an efficient pathway to screen new types of catalysts to convert carbon dioxide to higher-value products." Those problems are hardly a secret. Atmospheric carbon dioxide rose above 400 parts per million earlier this year, the highest it's been for at least 800,000 years, as measured through ice-core analysis. "If we can convert a sizable fraction of the carbon dioxide that is emitted, we could curb the rising levels of atmospheric carbon dioxide levels, which have been linked to climate change," said co-author Paul Kenis of the University of Illinois. In lab tests, NGQDs were able to reduce carbon dioxide by up to 90% and convert 45% into either ethylene or alcohol, comparable to copper electrocatalysts. Graphene quantum dots are atom-thick sheets of carbon atoms that have been split into particles about a nanometer thick and just a few nanometers wide. Adding nitrogen atoms to the dots promotes various chemical reactions when an electric current is applied and a feedstock like carbon dioxide is introduced. "Carbon is typically not a catalyst," Ajayan said. "One of our questions is why this doping is so effective. When nitrogen is inserted into the hexagonal graphitic lattice, there are multiple positions it can take. Each of these positions, depending on where nitrogen sits, should have different catalytic activity. So it's been a puzzle, and though people have written a lot of papers in the last five to 10 years on doped and defective carbon being catalytic, the puzzle is not really solved." "Our findings suggest that the pyridinic nitrogen (a basic organic compound) sitting at the edge of graphene quantum dots leads the catalytic conversion of carbon dioxide to hydrocarbons," said Rice postdoctoral researcher Jingjie Wu, co-lead author of the paper. "The next task is further increasing nitrogen concentration to help increase the yield of hydrocarbons." Ajayan noted that while electrocatalysis is effective at lab scales for now, industry relies on scalable thermal catalysis to produce fuels and chemicals. "For that reason, companies probably won't use it any time soon for large-scale production. But electrocatalysis can be easily done in the lab, and we showed it will be useful in the development of new catalysts." A novel light-activated material can chemically convert carbon dioxide into carbon monoxide without generating unwanted by-products.